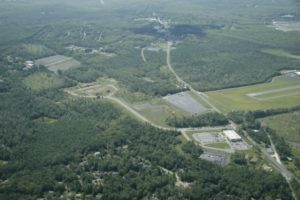 The Pocono Mountains Corporate Center East is strategically located on Route 611 in Coolbaugh Township, Monroe County just north of the Pocono Mountains Municipal Airport and about 5 miles from Interstate 380. The project totals 250 acres zoned for commercial/industrial development and designated Keystone Opportunity Zone and Keystone Innovation Zone. 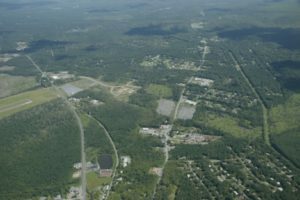 Pocono Mountains Economic Development Corporation acquired the in 1999 and redeveloped the site in cooperation with the County of Monroe, PPLElectric Utilities, PA Industrial Development Authority, Redevelopment Assistance Capital Program and the Redevelopment Authority of the County of Monroe. Infrastructure has been constructed on Phase A, Section I of the Corporate Center East and 70 acres are currently available for new projects. Engineering is underway for Phase A, Section II and Phase B for this part of the project. Completion of the Phase A, Section II and the Phase B projects will extend the road to Route 196 connecting it to Route 611. The park is zoned C-2 Office Park which allows for (but is not limited to) professional offices, banks, light manufacturing, research laboratories and technology companies. Contact PMEDC for a complete list of allowable uses and deed covenants. In addition to its great location, the park has some amenities that aren’t available everywhere. Walking trails are open to anyone with park benches along the way to sit and rest. We are constantly looking for ways to improve our telecommunications services through commercial aggregation and wireless services.